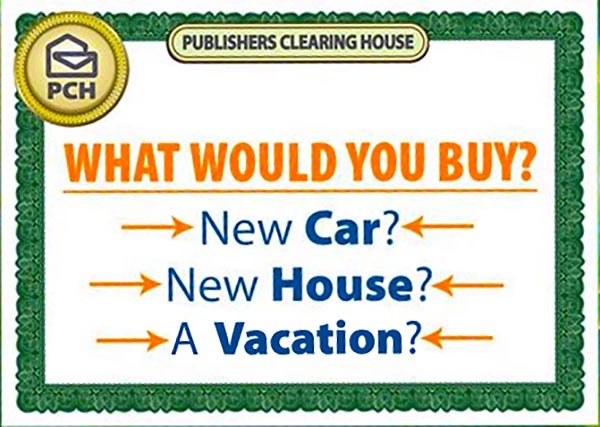 What Would You Do First If You Won PCH "Win It All"? The lucky winner will be known on June 29th. As many of you have already stated in the comment section of this blog, you are ready for that prize! Many of you know what they will do with that huge amount of cash. But let’s take a few minutes to dream a little. On June 29th you are the new multimillionaire! Will you quit your job first? At first, it is better to think about it. And what better than a short vacation to think. For me it would be a short vacation for sure. Take the time to make thoughtful decisions about all this money. You are multimillionaire now and your choice must be wise. Often the first question that comes to mind is: What would I do with my job? Bye Bye Boss! I quit! or you will be more like, I will take time to think about it! You know, being realistic, $1Million dollar cash and a guaranteed $1,000.00 a week for life, you don’t need to work anymore. But on the other hand some people are quite passionate by what they do for living and some will probably push it further and invest their money in a new company, in a sector they are passionate about. Some will even create jobs in this hard economy. Investments? Well, I think at first, it must be a simple investment until you have a clearer idea on how your going to invest that $1 Million dollar Cash. Many new millionaires have made quick and really bad investments. So, take you time and seek for a reliable consultant on financial investment and also a good accountant for the IRS. Now when everything is in place, your money is safe and you’ve team up with professionals. How will you spend this money? Will you realize your wildest dreams? Tell me about it. PCH if I win I will be the happiest person ,I would probably scream laugh shake my head in disbelief and it will take time for it to compute I am sure but I will be so grateful and thank full I will scream yell and thank PCH for the monehy I win and I will thank God for his blessing to me. PCH I am assuming I have lost it all. wow it is a lot to take again . It would be an answer to prayer….so much good could be done to help others, too….. If I should win I would help my family. Get them out of debt.Help with their school loans and house payments.I would redecorate my house.I also need to go to the dentist. I Want to “Win It All”! On June 30th. First thing I would do is get myself a new home just for the grand babies, start back at school, get my teeth fixed and travel. Maybe pay off km by parents place but definitely give back to the programs that are helping me stay off the streets. Baltimore deserves a winner and That I deserve to be that winner by far! Please PCH give back to to homeless by get ving me this chance! Here I am again and to say what I would do if I were lucky to win ,I would say first off THANK YOU and now I can travel to places I,ve omly dreamed about, I would help My 4 children and only 15 yr. old grandaughterwith Her education, I would give to some charity that are really helping those that are in need. I,m already a senior so I would be able to relax and enjoy life without worry, but its wishful thinking. However keep smiling LIFE is too short and thans for the opportunity to enter. I won’t to win no 4900so I can help my dad he is81 years old and my beautiful mom passed away it going to be2years in August. If i won i would give to Cancer Research,and pay my neighbor back for loaning me money for my furry pet that had to have emergency surgery yesterday to save her life at 16years old.I am not employed at the time so it would be a big stress relief for me and the rest of my family and friends. First I would fall down on my Knees and Thank the Almighty Lord God and his Son Jesus Christ for my Blessings for PCH choosing me as one of there Winner’s. I would give to my Father’s Church in Vacaville, CA; Build a Cancer Treatment Center of America in Antioch or Stockton, CA lots of Land to develop, all back East or South; Remodel the Antioch Senior Center Kitchen; Buy a Family House; Help my Children and Grandchildren for College; and get back on my Knees Praise the Almighty for this wonderful Blessings. Amen. I am disable with a 12 year old daughter . I have all ways work but with my disorder with my body it makes it hard for me to work but I have not giving up hope. I would put my family in a nice home and help others . I will bless people with this blessing. I would praise the Lord. Pay my bills and have enough money to buy the good food I should be eating for my health. Assist my 4 children, seven grandchildren, and two great grandchildren, along with a wonderful sister and brother, that are in poor health and have financial woes. I would be able to help the poor again. PCH you have helped make so many lives rich, I do pray it is my turn. Hi PCHSearch&Win, I would thank God, PCH and the PRIZE PATROL. I would give to the Church, the unfortunate namely; the children’s fund, hospitals and the Many organizations who need assistance. O, there are so many that need our help and assistance. THANKS SO VERY MUCH. If i were to win which i doubt it, i would thank god and swear to god that everyone will be getting a book in the mail that has a ton of medical information in it ( over 200 ). I not only post the websites, companies, phone numbers, but also who to contact as well for Free medications. As well as i explain step by step how to get your hospital bills paid. I also tell you how to get free medications before you leave a hospital as well and not costing you anything. As well as there is a site that will also pay for doctors visits as well as hospital bills. And there the third medical site i have not only will see you from head to toe but when they find out exactly what all is wrong with you they will put you on a waiting list but they will fly you up there and take care of the issues and fly you back home when your released. As far as glasses go there are two places i know of to help people out in the pocket book. The first one all you have to do is pay for 2 things. I know your going the most costly items, wrong! You have to pay for the eye exam. and get the doctor to write it out on a prescription and this is why. I not only give you a website and a phone number because when you go online you can pic out the type of frame, and send the prescription with $24.00 for untinted glasses and yes you can get tinted glasses if you want. I’m just one of over a dozen nurses in our family besides having a doctor, 2 administrators, an aunt that is both a RN as well as she taught nursing, and a grandmother that did medical billing and retired from it. I knew if i didn’t put this information together now it would never be done. I have bee fighting cancer for 4 years. Very very expensive. Been married for 57 years–never had a honeymoon. Would love to take a trip and see the US. Life is short and to do some of the things I would love to do takes money. Wish me LUCK. I will take care of my family. Win it all, will make every dream come to a whole new beginning of adventure. Would love to explore the world and learn new culture. Growing up with a family of 11 child is difficult. Every help you get is a blessing. Life is what you get by what you gave. Never gave up and quit anything. Continue doing what you love and know. Every light that shine from the sunrise is a blessing to never forget where it all started. Thank you! If I won it all I would pay off all my bills,look for my own place.help family and others.go for a vacation and relax a lot. The first thing I’ll do is thank God, then tell my wife. Take care of my Mother in law. Give my Church it’s part. Then go on Vacation. Pch if I won the win it all sweep stakes I’d cry with joy ! My man job. Closed down .so he out of job and iam disable .we could sure use a mircle at this time. If I win, I would like to thank god for giving me this chance to prove myself to everyone that I am a careing loving person that I would give to the homeless & a charity organization & send in my tidings to Peterpopoff that’s the church that I’m into & I want to win it all, I just want to help those that needs help besides me. If I would get luck and win the 2 million and the 10 thousand I help out the children hospital for the sick kids with cancer. With the money I donate to the hospital will help fine a cure and make those kid better. Then I build me a new home for me and my kids and then I help people I know , in my side of the family I give them some money to help them out. But most of all I would pay off my grandkids car and their college fund as long as it takes until they graduate. Then I buy my youngest daughter a 67 vette split window cause she loves them. Then I buy my dream car a 69 Chevy yenko Camaro then I take me an my wife on a long over seas vacation, like France, Rome, Ireland, Hawaii and a few more. and to donate to charities help children! I would be able to pay for all of my medications, that I have to take for the rest of my life because of my Cancer, and not to be dependent upon my states Medicaid, so that I can be free. finally have a place that I could call “HOME” to live the rest of my life happy and positive, to be on my own again, run my own life ! PCH, I AM REGISTERING AFOREMENTIONED PRIZE NUMBER THAT COULD MAKE ME A WINNER ON June 30th I now entitled to go on June 30th! I NOW ENTITLED TO GO for an incredible $10,000 cash prize from Gwy No.7028 / Early Notice from search&winRe: WIN IT ALL $2,000,000.00 up front,plus more! Ready for award on June 30th “Winner SEARCH IMMINENT” /+$50,000.00 Carefree Cash. PLEASE Full ACTIVATION to WIN! my Entry ,Please Confirm & ACTIVATE to Win,” Ensure to Secure” #Knock knock# I AM #IN IT TO WIN IT All! I’m playing to win. I’m entering Gwy No #6884 & June30th, win it all prize winner from Gwy No # 6900 to win it all prize will receive $2,000.000.00& plus $10,000.00 a month for life on top of that a brand new Lincoln MKZ valued over $36,115.00 entitled to the winner. I am claiming it all and I want to win, June 30th, Prize Winner Gwy No #6900 I’m still entering from life. 3. To give away smoe money to Charity. I would pay off my home and fix it up as it really needs it. I had a bad operation that put me in a wheel chair. I lost my job and was put on Disibalty income which doesn’t cover everything and I am about to loose my home and be put into a nursing home which I will not be able to deal with, so that is what I will do with the $7,000.00 a week if I should win. I will also like to give to the care and rescue of all the homeless animals in this county. PLEASE pray with me that I will win. I would buy myself a home. . Get a car for much cheaper than the Lincoln.. I could get myself a car and a van to help pick up everyone, also a motel or 2 to help all the homeless have nutritious homemade meals everyday and stay out of the heat and cold. Been homeless for year now. Finally have room which is great for me but very very expensive. No car, nd some health issues need taken care of. I Have had one vacation my whole life so one thing be a cruise somewhere..After have help hired to take care of everything while I am gone for week or two. I’m planning to donate to several Charities,Animal Shelters,my family, give back to America(help get the WTC Towers rebuilt). ” lump-sum payout Giveaway No. 6900 We will be taking a Special Early Look for a SuperPrize winner from Giveaway No. 4900. All June 30th Special Early Look online Win It All Bulletins/Promotions during the timeframe of 4/21/15 through 6/23/15 will be assigned valid SuperPrize Numbers fully eligible to win a lump-sum payment of $2,000,000.00, a Brand New Lincoln MKZ (or the $37,315.00 cash equivalent) plus $10,000.00 A-Month-For-Life SuperPrize from Giveaway No. 4900 on June 30th, 2015. These SuperPrize Numbers will also be fully eligible to win a guaranteed $1 Million SuperPrize on June 30th, 2015 in a Second Chance Drawing” Good Luck! I have cancer and could use the money to pay my medical bills.Any amount would be a blessing. hi danialle, todd,dave welcome to the new member in the group. am writing to say I been playing daily , and entering all kind of pch sweepstakes playing many games and win million’s of tokens every day I am dreaming of a knock at my door my heart hurts because I know how bad my family needs this my mom is 81 years old. I have five other bother’s and sister’s that I haven’t seen in 10 year’s my hope is winnig this for my mother because she raise ten kids as a single mom and 12 grand kids and that way am trying to win to thank her and let her know I love her. thank you. I would pay my bills, help my family. I would help the DAV, PVA and the Wounded Warrior Program. God Bless America and Her Own. The first thing would do is to than God, and then pay off all my debt. The next thing pay my ties at Church and the share with my family and then have the house build the way I always dream of and live happy every after Lord say the same. Dear PCH, the first thing I would do is pay for a car, I need to get out of mountains, to do MORE than I’m currently able to do… I was an abused woman. He traded my car (paid off) and bought a landrover. I was in another state hiding. When I left him due to severe abuse…. he had it repo’d . I’ve not been able to get a car since. Then to the foundation to help so many!! Then pay 2 yrs rent with a thank you so much, and then drs. So I can live. I would move.buy a small house. In utha.Brigham city. Then I would have a home. For my kids and grandbabys to come meet me for the first time. And. Have my grandbabys and kids have stay overs .thank you pchforgiven me a chance. At life. Give thanks to GOD for answer my prayers,for give me the opportunity to help my parents, my son ,my brothers and sister to have a better life ,help them to have their own home where they can live without economical limitations and worries. FIRST I WOULD THANK OUR LORD AND THANK PCH AND THEN PAY ALL MY BILLS OF ,BUY ANEW SUV AND TRAVEL TRAITER AND THEN HELP MY KIDS AND FRENDS. PCH please Tag it all for me I and trusting I will win it all my notes are high and I am trusting Praying and for some reason I have a good feeling about winning. I hope I am not wrong but Even if a doubt comes I still have that wonderful feeling that I will win I sure hope so every thing else is going wrong . Pay all my bill’s off an go on a well deserved vacation. Want to win it all. Thank you PCH! i am in bad health and i just would like to have the winning to pay for my daughter college and pay of some bills so if i got worse than my wife would not have to worry about our bills or help my daughter , god bles you all an thank you. Well I was blessed to have gotten the postcard as well in the mail. Unfortunally though when I went to enter those numbers to #4900 it all went arie and I was not able to continue and be able to post for the grand prize,,, Such Is life, spin the wheel till the brakes fall off, and now when its broke, you have nothing,, good luck to all, and to all a happy New Year, Tracy Satterwhite…. I’d get down on my knees an thank God an PCH take care my children family. . St. Jude’s . An I’d help the vets , for my husband was a Navy man I just lost him to God at just before thanksgiving so I’d get him a stone for his resting place. Just be greatfull for the lincoln . A little money be great I’d put a new roof on my old house well that’s what I’d. First fall on my knees and thank God, next pay all my debts, and give my children and grand children money. If I won I would drop to my knees and cry then I would pick myself up start a bank account for my kids and grandkids and then pay all of my bills. Give Thanks to the Lord first, and then set up a bank account for my four grandkids and my three living kids. and give to my mother and my six sister and brother and then me and my husband with sit back and what have to worry about being hungry again are any bill’s getting cut off. well it has been a ruff year my wife fighting cancer but she is steal here with my I would pay all my doctor bills so I won’t lose everthing we own and help a lot of people I know that could use a little sunlite in there lives. Shawn halfon. December 25 -2015. 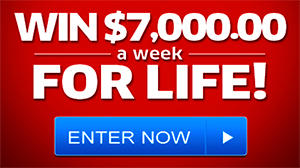 I want to win the 5,000 a week for life. I want to let Pchsearch&win know I want. To win i should let the world know I want. To win this so i hope you get it this i want To win! First, I would thank God for the opportunity of playing pch, then help my family and others in need, think about what to do next. Out of debt, help repair friends home that has taken me off the street as they are retired on fixed income and buy them a new car. Then buy home and a car for myself. Put money away for grandkids college. Get a degree for psychology and accounting. Get my dog fixed. Help the homeless to have shelter and food and all they need. 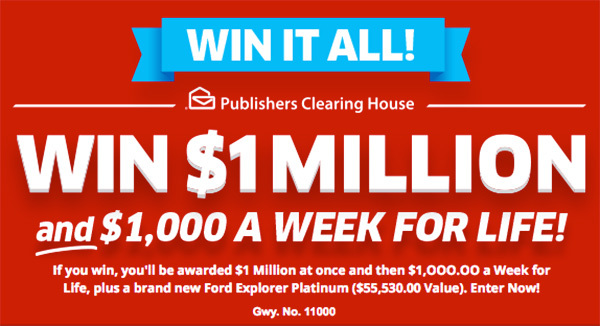 Pch, if I win this superprize, I would pay IRS first, and Taxes to Raleigh North Carolina, etc.and immediately Purchase our brand new home that’s ready right now in Christo ridge, NC, and pay off all of my bills, and my truck note, I would donate to the children of St jude, immediately, and there’s a lot of street people with no where to go, I would invest into a couple of group homes and jobs for them to ease the ones that can’t help themselves, and their families, and my wife and I who has never had a Honeymoon, since we got Married in May 6th 2012, we would rest, and finally do some me time. PCH PLEASE MAKE MY DREAMS COME TRUE, so that the church that I attend In Salisbury North Carolina, can also have some work done and the Pastor and his wife could have better help in the ministry. The first thing I do when I become a big winner is to pay my tithes, 10% to the Lord’s work. Then build a small church at my late mother’s town and also help Pastors who walk to preach the Gospel everywhere in the Philippines. there are ministries I have been giving here and abroad. What would I do First-Thank the Lord and Thank Publishers Clearing House and just laugh and rejoice with happiness .I no my feeling would be so joyful .I may cry too. I will win this PCH 4900 on Dec 30th! My vision is to help all those who are homeless and needy. I will help those who are suffering in various parts of the US- as I will be receiving this to give it away!! Our country is in dire need of help from those who care- and with my whole heart, body, and spirit- I sincerely CARE!!! The ability to brighten someone’s day- and possibly their life with a caring gift is what makes my spirit soar above the clouds!!! Make Grandma Cindy smile with a new car and puppy, then as a police officer, take the whole department out for a great dinner, give thanks and donation to the church and Salvation Arny….then bank the rest for a rainy day. First I would buy a new one story house so my husband and I don’t have to climb stairs. Then a NEW Ford Vehicle that get better mileage than 11.5 mpg. I just love FORDS!!!!! Pay off my bills. Help my kids and grandkids especially my youngest who is in college. Then I could concentrate on doing some contributions to charities that I want to help. Gosh it just would make life more affordable to do the things I need to bring my health back. God Bless All!!! i would love to win something i have put alot of time in on this i am in bad health it would help me pay off some bills and if something does happen to me my wife would be in better shape may god bless you all . First thing I would thank God, for such a blessing, and everyone at PCH that made it happen! First thing I would do would be to thank God, and then cry tears of joy, pay off all my debts, and travel around the world. PCH if I win it All I want to go visit some family first travel give to others and back to school after my heart surgery. I want to win and win big I would love to have my house fixed warmer I freeze the floors are so cold I can’t hardly walk on them barefooted. I have to wear a coat or house coat in my house all the time even though this is a fairly new home only 5 years sol that is no inoculation in the walls the attic needs more insolation th floors need coils in the floor on the cement to keep my feet warm. there is so many things I would do if I only had money and by all means I need to pay mi=y wills off which I did not have any unit 1 monts ago. Would love to win money so I could take care of me and my family!! Also my sister she can get anything she would like to have! Good luck to the winner!! 12 30 15 1 st thing i would do FAINT then i would just keep touching check to make sure its REALLY my name on it that will take a few hours no doubt then get a ride to bank with a lot of reall happy thoughts get sevaral certifyed checks for several people and send to cancer hospital for children cancer soiceity list gos on and on hope i have enough to pay my bills !!!!!!! If I won it all from pch the first thing I’ll do is relocate take time to think . The first thing I would do if I won it all is buy a new home help my family cook a big dinner in my new home invite friends and family . hi my name is john urmetz please please let me win then i will tell you what i wood do if i win !! Call family friends job lawyer leave home for a few weeks to focus. Save the World! Making the World an Better place for everyone, healthy and Happy Spend time with my Family make the World Go Around and Everyone Work Together No one has have go to War and Blow things Up! I WOULD PAY ALL MY BILL’s I HAVE OUT THERE !! PCH I want to win it all and why not me. PCH life is short and getting shorter every day and I want to win and need to win. i won the 5.000 a week i would pay for my grandkids collage and then buy me a new van for disabled vet me. and buy me and my wife a new home and then help my three kids.. If I win I would pay all my bills and buy my sisters and my sons a home. they are all struggling to make it and even though we all worked hard and went to school like our parents told us to we constantly struggle to make it in the society. I would buy some land and build and day care for low income families. Dear PCH, I’ve been doing your sweepstakes since I’ve been 18 years old. On July 22nd, 2015 I just turned 60 years old. I’d like to pay for my son’s college education, he just turned 22 on July 13th, 2015. As well as doing this, I would love to retire at a job that I have worked for for 41 years this December. I want to travel, do my volunteer work and have a cushion for any medical bills and any thing that may come up in the near future. I guess after playing PCHafter 42 years winning anything is not in my future. Thanks for the opportunity to share my thoughts. Thank u I’ll keep playing keep wining thanks pch. I’VE said before MY sister needs a new house or badly need A great deal of repair and my family needs help and I sure need to pay taxes on my home and pay my past due bills and take long vaction with my family. I WOULD ENJOY LIFE TO ITS FULLIST! The first thing I would do is jump for joy!!! AND HUG YOUR NECKS!! !Then I would buy me a TinyHouse,just right for me and CHLOE,and go on a vacation,I’ve never had the privilege to do,think I’d go on a cruise,one that would let me BRING my Yorker with me cause we are inseparable,Maybe tour Europe and some of the island, that’s truly a fantasy for me,But the really important thing to do first is get my Cochlear implants done !! !And maybe take my sister’s along too!!!! The first thing I would do is jump for the joy of winning then start hugs for the PCH team, I usually cry when I’m estaticly happy,who knows what Id say,lol I just be awestruck!! If I won I, I would put a headstone on my X-husbands’ grave site. Then I would move back to Georgetown California to relocate my son back to his home roots. I would make sure my Father was happy and well taken care of. I would also give back to the local food bank here in Foresthill California. They have put food on our kitchen table many times during are hardship when I could not. I also most definitely would take my 13 year old son anywhere he wanted to go and give him a life he deserves. Thank you so very much PCH for being interested. I would also like to give my gratitude for the fun and exciting games, news and everything you are. I would help my girlfriend son’s get out of debt. Then my girlfriend and I would take a trip to Italy. We have never been able to go on a vacation. I would also donate to the homeless shelter. I would also donate to a organization that helps people in need of finances help. What would i do if I won #4900 giveaway? I would thank God for the blessings of such a thing coming my way. I would payoff all debts and have fun traveling where I could. I cannot go everywhere I would like to go for physical reasons. I would help others, who have much less than I do. What a blessing it would be to be a winner, thank God and PCH for the opportunity to enter this contest. I know that I would love to be the winner of the $5,000.00 a week for two life times “Forever” Prize with pch no 4900, plus I would be excited to win the $25,000.00 Golden Ticket Award with pch no 4749.
to get a return on my investments. And be VERY GREATFUL. First, I would help as many of the Homeless people that I could. There is a Church not to far from here that feeds the Homeless every week. I would try to help them. Help my kids and myself. Please come see me….